Grossmont Conference high schools tested their salt at the Mt. Carmel Track & Field Invitational on March 26, joining 94 other schools who came to participate in one of the largest national meets in the country. Hosted by the Sundevils at Mt. Carmel High School, the meet celebrated its 37th anniversary this year with teams coming from as far away as New York and Texas. Mt. Carmel Sprint Coach Shan Forehand said events like this one are good breeding grounds for healthy competition. East County schools held their own amid the throng of national competitors, several of whom hold state records. Mt. Miguel High School senior Laulauga Tausaga-collins took first in division two girl’s discus throw (156-09) and division three shot put (45-00.75) while her sophomore Matador teammate Miracle Maseuli took second in division two girl’s shot put (34-09.25). Sophomore Justice Chima won the boy’s division one high jump (6-00.00). Santana junior Brianna Kruis took first in division three girl’s high jump (5-04.00). 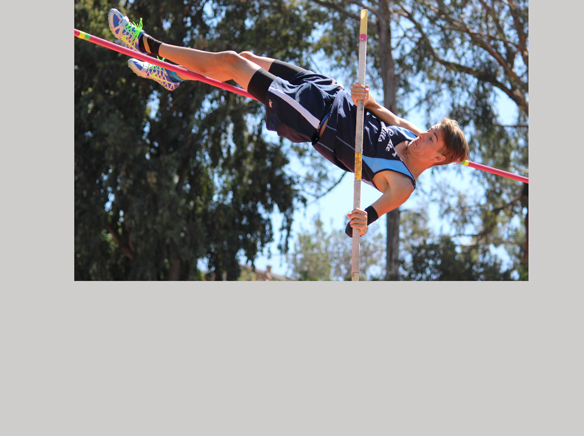 Mitchell Holder, a junior from the West Hills Wolf Pack, won boy’s division one pole vault (13-02.00). Sophomore Wesley Coleman of Granite Hills and Carter Jewel from Grossmont vaulted 12-02.00, coming in seventh and eighth. 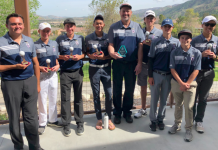 Erik Dann, head coach at Granite Hills, said that although the Eagles have fewer seasoned competitors this year, they still plan to have a good run. Santana junior Janice Deguerio tied for third in the girl’s division one 800 meter, crossing the finish line at 2:25.8. Her teammate in the boy’s division one 1600 meter, senior Kibrom Elias, nabbed second place with a run time of 4:33.26. Steele Canyon and Helix runners came in behind him to take fourth and fifth. Helix senior Mason Vineyard finished boy’s division one 110 meter hurdles in second place. He clocked in at 15.02. Granite Hills senior Wyatt Adams followed him into fifth place (40.60). Tajanique Bell, a senior at Steele Canyon, took second in the girl’s 300 meter hurdles, clocking in at 44.07. 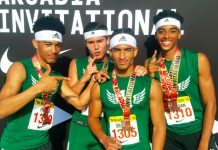 Both of Helix’s division one 4×100 relay teams placed in the top ten. The boy’s team took third with a time of 43.10. Granite Hills boys took fifth in the division one 4×400 relay and the girls took fourth in the division one 4×800 relay. Valhalla head coach Garrett Ince said the Grossmont Conference always provides quality competition. Valhalla had several competitors on the field, including division one long jumper Elizabeth Yocom. The junior Norseman placed 12th (15-06.75). “We have a smaller number of competitors than other schools here, but each one is quality,” said Ince. Conference meets begin after spring break.